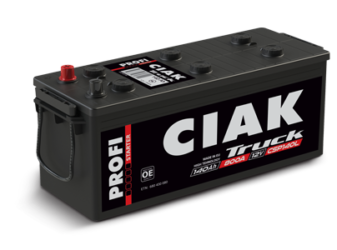 CIAK TRUCK PROFI batteries are specially designed for the most extreme road vehicles that, besides transporting maximum weight for moving on public roads, are frequently the only home to drivers. 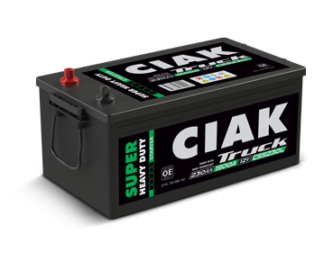 CIAK TRUCK PROFI is technologically designed for deep discharge of up to 80% of the overall capacity what makes it the unique product in the offer for this type of vehicles.Large use of top consumers does not present any problem for CIAK TRUCK PROFI batteries even at the increased stopping period. The biggest advantage of this battery is in the number of recharging cycles which are 3 times higher than in standard technology. Also, it is the only battery which to its users offers up to 30% bigger usability of the rated capacity. CIAK TRUCK PROFI offers exceptional starting power, as well as durability necessary for long driving and frequent use of consumers, when the vehicle is without ignition aggregate. Batteries for commercial vehicles, trucks and industrial vehicles are a combination of high durability and exceptionally reliable use efficiency. Heavy duty batteries with technology for subsequent maintenance are ideal for vehicles with lower charging needs and alternative additional energy source. It is ideal for dump trucks, bulldozers, mini busses and tractors. It’s tested hybrid technology enables excellent performance with high charging reserves. Its tested quality and key investing in quality improvement and resistance to extreme working conditions (dust, frequent starting and stopping, vibrations) make it ideal choice for this type of vehicles. 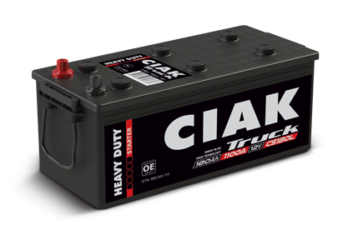 Battery that possesses all advantages of CIAK TRUCK HEAVY DUTY line with the addition that the technology of construction has gone one step further and enabled that this battery does not require maintenance (Maintenance Free) after installation. The emergence of this technology in massive application on trucks, vans, buses, firefighting vehicles or construction machines resulted in the maximum reduction of costs per vehicle unit. CIAK TRUCK SUPER HEAVY DUTY is primarily meant for vehicles that transport on long distances with rare return to base and demand as much as possible less maintenance and rare controls during exploitation period. By applying labyrinth lid without classic steam caps that condensate during battery use they are returning to the battery. This procedure enables almost no loss of liquid from the battery. Also, labyrinth lid enables significant leaning of the battery in comparison to the standard battery. As additional safety batteries contain opening for venting and are safe from flames inside of the battery. This SMF technology enables the use of entire space inside the battery. It also prevents sludge clustering beneath the electrodes. Also, faster battery charging with bigger quantity of acid solution (electrolyte) is achieved through this technology, what directly influences on the reduction of corrosion of uncovered lead collectors.